3M™ Finesse-it™ Natural Buffing Pad is made with select lamb’s wool hide, trimmed to 20 mm length to offer a more aggressive cut than longer-fibre pads. The natural hide holds each fibre individually, which minimises lint discharge. The dense pile surface holds the polish for even, consistent material distribution while minimising splatter and jumping. Our Finesse-it™ Natural Buffing Pad is ideal for buffing automotive OEM, marine, and aerospace coatings. When used in conjunction with our Finesse-it polishes, the pad quickly removes finishing abrasive sand scratches, oxidation, and other paint surface defects. Resulting finish may require a follow up polishing step with a finer pad to completely remove swirl marks. This pad is manufactured with the 3M™ Hookit™ attachment system for quick pad mounting and removal, and to hold the pad securely in place during use. Our Hookit™ buffing pads conveniently and firmly attach to a hook-and-loop backup disc pad (sold separately) on rotary or random orbital tools, can be removed cleanly and easily, and can be re-used again and again for the life of the pad. 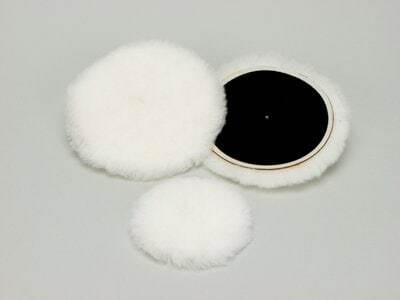 Finish results are dependent on specific polish used, coating type, and the tool used.Wool buffing pads are generally more aggressive and easier to control than foam pads. They have a greater available cutting surface area due to the presence of thousands of fibres. These fibres provide faster cutting action than foam pads, Wool fibres hold the polish to provide even distribution of material and require less pressure from the operator. The nap helps wool pads glide and conform to contours, making them easier to control than foam pads. Because of their cutting ability, wool pads are effective for removing sanding scratches and perform best on rotary type buffing tools. Depending on the polish type, individual technique, composition of the coating, and the tool used, finishing with a wool pad may require a follow-up step with a foam pad and polish to remove micro-marring or swirl marks.Our Finesse-it™ products are a line of specially engineered abrasives, compounds, polishes, and buffing pads to be used on OEM and baked refinish paints to remove defects, sand scratches, or swirl marks on a variety of painted surfaces. 3M™ Finesse-it™ products are an integral part of a 3M recommended buffing system for repairing surface defects to clear coats, lacquered wood, solid surfaces, gelcoat, powder coat, industrial paint, acrylic, and glass.